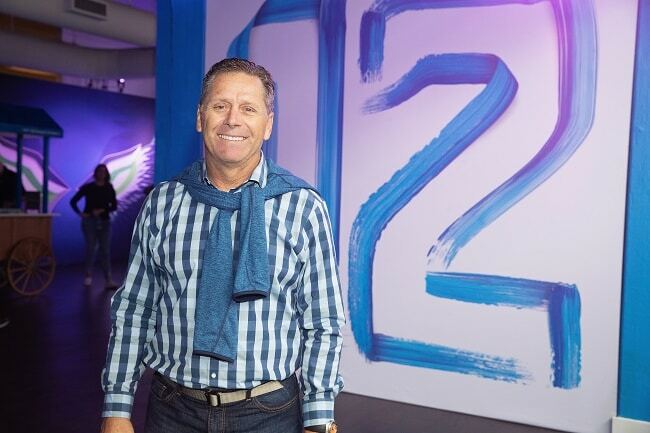 The American Express Experience located in the SoDo district hosted Card Members and Seattle Seahawks fans during a grand opening together with team legend Steve Largent before the Dallas Cowboys game at Century Link Field on Sunday. The Sports Techie community blog loves to cover NFL business, sponsorship, social and technology news. AMEX and the Hawks have a unique partnership unlike any other professional football organization. As a result, they push the partnership envelope resulting in tech innovation, memorable engagements and absolute fun. 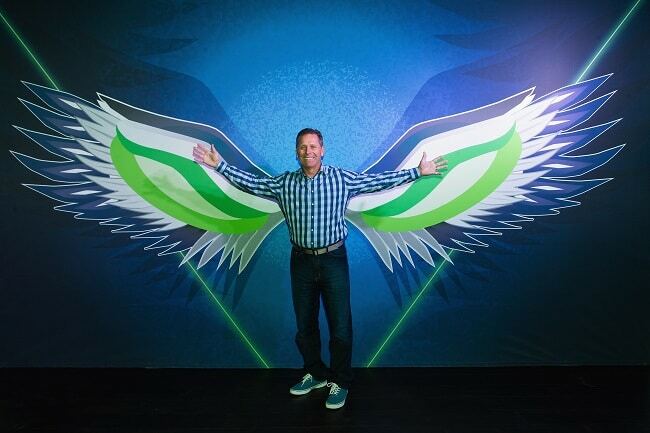 The relationship between the Seahawks, AMEX and 12s has never been stronger. Getting Hawks fans to CLink stadium is not much an issue in Seattle as it might be in other stadiums and venues around the country because all home games are sellouts and the 12thman roars. It makes sense then to offer more opportunities for Seahawk fans to get together and share in their love of the team, players and coaches before a game or during the week and weekend, especially for division rivalry and significant television games on TNF, SNF and MNF. The inaugural American Express Experience is the first highlight of this season’s American Express’ 2018 partnership with the Seahawks, where the pregame activation will continue as a one-of-a-kind experience that 12s can freely access before every Seahawks home game this season. Look forward to fan-centric activities to help fans pump up for the game provided by AMEX. 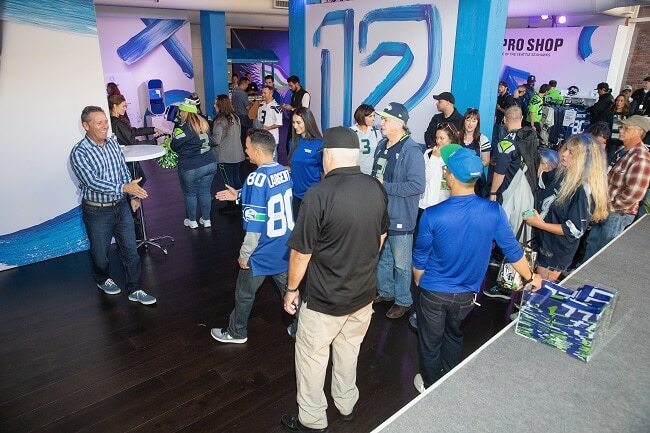 This activation featured a special appearance by Largent, a Hall of Fame player I grew up idolizing, who joined fans for autographs and photo opportunities. Hawks face paint, foam finger, fantasy sports apps, American Express® Card. Whether you’re at CenturyLink Field or cheering on the Hawks around Seattle, your Card gets you more on game day. Open 3 hours prior to every Seahawks home game, until kickoff. *Talent subject to change. American Express does not guarantee everyone who wants to meet the talent will have the opportunity to do so. Space is limited. **Receive 20% off all full-priced in-stock items (excluding gift cards, taxes, fees and gratuities) when you use any American Express® Card to pay for your purchase at the Pro Shop inside the American Express Experience. Offer valid during open hours at the American Express Experience. Not valid on previous purchases; cannot be combined with any other offer. Offer has no cash value. Offer may be modified or discounted at any time without notice. Fulfillment of this offer is sole responsibility of the Seattle Seahawks. ^Offer available while supplies last. Bottled soda or water only. Alcohol is excluded. Must purchase all 3 items listed to receive discount. Offer has no cash value; cannot be applied to past purchases. 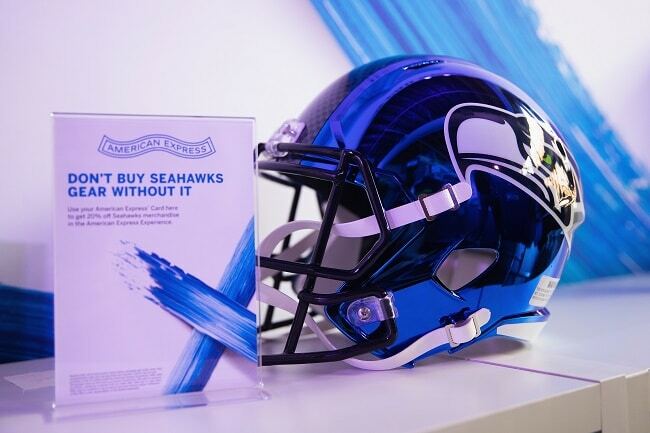 American Express is returning with the Seattle Seahawks partnership for the 2018 season (its sole NFL sponsorship), bringing back its All For The 12s platform that provides a variety of benefits for Card Members and the 12s all season long. Benefits include the new American Express Experience pregame activation, in-stadium offers, and more. Social media follows (#AmexLife / @AmericanExpress). Sports Techiee, Don’t Game Day Without It! Cam Chancellor raised the 12th man flag before the lovely afternoon game, Largent was in attendance greeting folks at the AMEX Experience and the Seahawks destroyed the Cowboys for the first win of the season. Sounds like a terrific gameday. The 12s fandom extends here to Atlanta and across the nation through local Seahawkers groups. Make THE American Express Experience sponsorship part of your game day.